The Villa Alazani sits on the western edge of the village of Kisiskhevi in the ancient wine-making province of Kakheti. 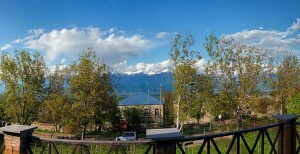 The house looks north to the Caucasus mountains, which tower over the verdant Alazani valley, the heart of Georgian viniculture. Experts have established that Georgians have been making wine here for over 8,000 years, which probably makes Kakheti the cradle of wine. 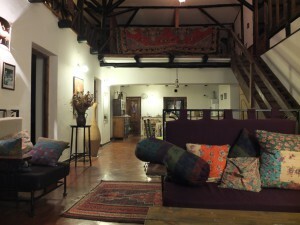 Sit on our balcony in the evening with a glass of home-made wine in your hand and let your imagination fly. In the 19th century, before the Soviet Union did its level best to destroy an ancient tradition, the wines of Kisiskhevi were considered among the best in Georgia and today they are once more at the forefront as the story of wine in Georgia turns yet another page. 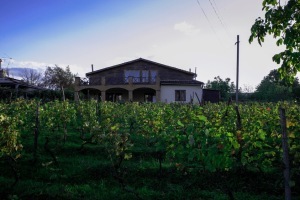 The house has a small vineyard at the front, mostly planted with rkatsiteli grapes (the most widely planted Georgian variety) but we have another larger vineyard on the northern outskirts of the village. We also grow some saperavi (red) grapes but most of our wine is white. We make about 400 litres every year, which should be enough for ourselves and our visitors! 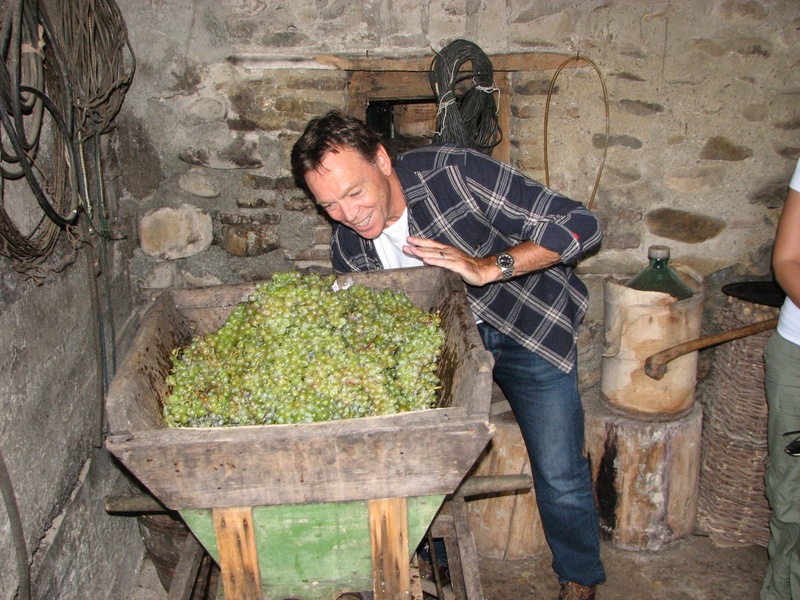 Our wine-maker is Temuri Zaalishvili, who also looks after our house and is a well-known character in the village. Temuri is born and bred in Kisiskhevi and knows everything there is to know about its history and way of life. If you want to go on a walk in the forests and mountains behind the house ask him and he’ll tell you all you need to know. He’s also in great demand locally as a toast-master or tamada, a highly respected position among the Georgians, who like nothing better than to sit around a table groaning with food and wine and make toasts for hours on end! Temuri’s family comes from generations of wine-makers and, like all family producers in Kakheti, he makes his wine in the traditional way – the same way they have made their wine here for thousands of years. Georgians make their wine in kvevris, huge clay vessels, whose shape is rather like an amphora. Instead of pressing the juice off the skins, they leave it to macerate on what they call the tchatcha – the crushed skins, pips and pulp – for anything between two weeks and six months. 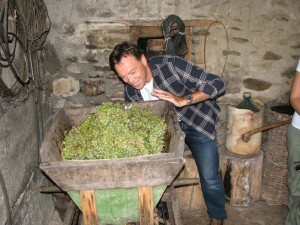 It’s this that gives Georgian white wines their amber colour and high tannins. Temuri lives in the village just a short walk away from Villa Alazani. He has his own traditional marani, or wine cellar, and is always happy to share his knowledge of the skills and customs of Georgian wine-making – and, of course, his wine. 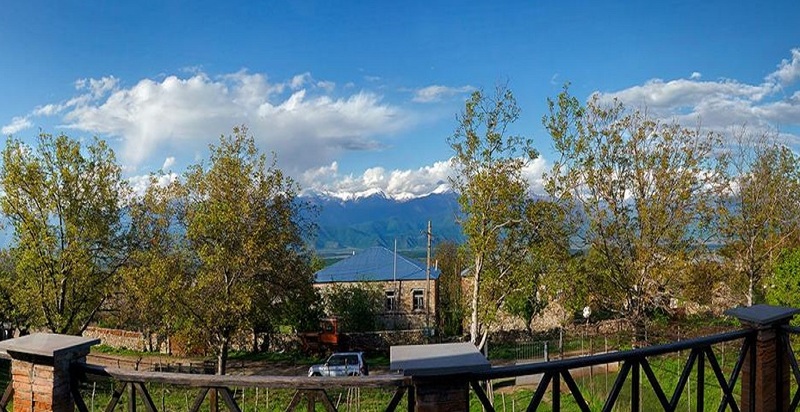 The villa has four double bedrooms, two bathrooms, an upstairs gallery and an outsize veranda with a stunning view across the Alazani valley to the mountains of the Caucasus. The gallery has a lovely sitting space, where you can relax and read while enjoying the view of the Caucasus through the window. Upstairs, we have an extensive collection of English-language books (as well as some in French, Georgian and Russian), which includes a wide-ranging selection on the history, culture, literature, wildlife and flora of Georgia. There are also three small open rooms upstairs, which make wonderful bedrooms for children. Downstairs, the house has an open, American-style kitchen and a dining and lounge area like a small baronial hall, where you can relax and feast like a true Georgian! 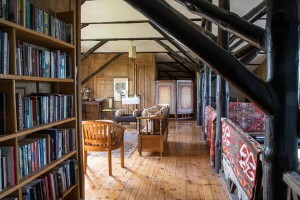 For guests planning to visit in winter, there is a fireplace downstairs and two wood-burning stoves. Each bedroom has a radiator. The vineyard is at the front and western side of the house. At the back of the house there is a garden, which we are currently developing. We are planting fruit trees and laying paths. We are also creating shaded areas for al-fresco dining, where visitors can escape from the summer sun.